SITE LAST UPDATED 10/01/97 This Site Dedicated to Orchid Lovers Everywhere! Neofinetia is a monotypic genus from China, Korea, Japan and the Ryukyu Islands, an intermediate grower that blooms in early summer, it is best mounted on tree fern or cork here in warm conditions. 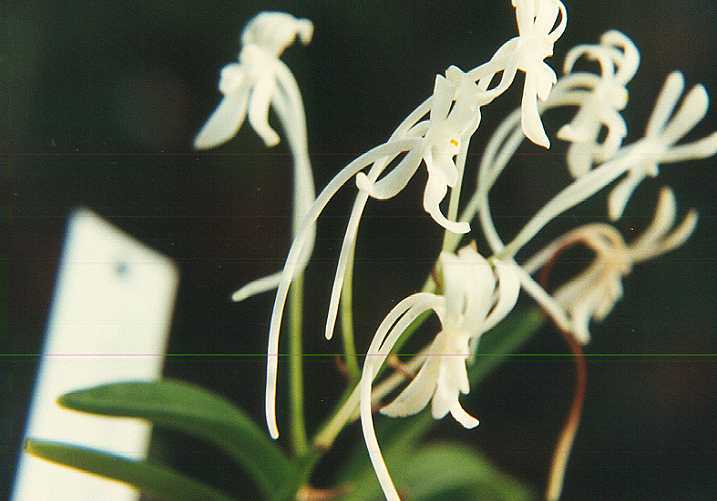 The flowers of Neofinetia falcata are white to pink with free sepals and petals with an erect lip with a long filiform spur at it's base, and a short, winged, fleshy column without a foot and it has 2 pollina and a large stigma. It was discovered by Thunberg in 1784 and placed in the genus Orchis, then in 1925 H.H. Hu moved it to it's present genus Neofinetia.